Not all truck bed covers are created equal, and the Undercover UltraFlex is the proof. It has numerous amazing features and it is a standout in the line of hard-folding truck covers. The first thing that stands out about this truck cover is its gorgeous, uniform matte colored finish. Manufacturers of truck bed covers have started to change their focus towards the less shinny finish style over the past few years. This is because covers with matte colors provide better resistance on UV rays and they are also less prone to fading over time. This is ideal for those days that reach 100 degrees. Matte colored finishes have become popular as well in the automotive industry. Nerf bars, bumpers and even truck boxes are undergoing the change and they got the matte treatment. This truck bed cover can be paired perfectly with other truck accessories. What is Undercover ultra flex? What to expect in Undercover Ultra Flex and who is it for? How to install Undercover Ultra Flex? What are the alternatives to Undercover Ultra Flex? Undercover ultra flex is made of aircraft aluminum grade panels that have been matte finished so that it would be UV resistant. The underside of the panels of this truck bed cover has a luxurious and beautiful BedRug finish that is carpeted. The Undercover Ultra Flex uses rubber seals that are EPDM and it hinges so it gives maximum security from snow and rain. The cover rails also help in this by making the excess water channel through the drain tubes that are provided. The Undercover Ultra Flex can be easily installed with no drilling necessary because of its clamp-on design. All you need are the basic tools like the socket wrench to complete its installation on most trucks. 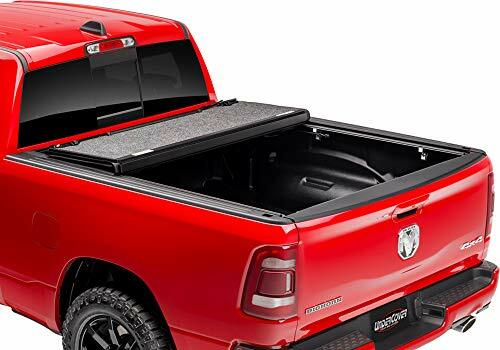 An amazing feature of this truck cover is that it can gain full truck bed access without you having to completely remove it. All that you need to do is to fold the cover panel by panel to the front area of the bed, then you need to secure the prop rods that are placed to hold it in an upright position. Your truck can be driven with the truck bed cover left in this position even at fast speeds. Ultra Flex comes with integrated rail light that gives the convenience of having a light when you drive, especially at night. Easy to purchase with up to 3 years warranty 5 years warranty. The tailgate of this truck bed cover has the ability to close without opening the cover. It also has an automatic slam that is handy because it latches open from both sides of the bed. It also made with aluminium materials give it that OEM look. After purchasing an Ultra flex type of undercover, it comes with some certain essential materials. When you unbox your Undercover Ultra Fex you should find the panels inside with is like the most essential part in the box. Also in the box, you would find a dual L shaped rail for holding the panel and a clamp for holding the panel to the bed of your truck. Additional to these, when you purchase , it comes with a saddlebag and has a special lighting system that can be used to illuminate the inside of the bed. An alternative to the Undercover Ultra Flex is the AlloyCover. It is a low-profile, lightweight foldable truck bed cover that helps protect your truck bed from harsh weather conditions, elements and theft without compromising the strength and the style. This truck bed cover was made to reduce excessive noises and unwanted vibrations that are commonly found in truck bed covers. The AlloyCover has incorporated rubber seals that are flexible, hinges that are vinyl coated and metal-on-metal contact are reduced for a quiet and nice ride in front. When it comes to truck bed covers, the Undercover Ultraflex is one of the best in the market. It may be costly, but the benefits are surely worth it. It can keep your cargo safe and your truck bed clean. It can also protect it from UV rays and harsh weather conditions. It is easy to install and easy to use plus no matter how fast you go, you will be assured that it is still latched at either side of the bed. It is strong, durable and definitely one of the best in the market.